A reader writes to say: Someone correct me if I am wrong (but I believe I remembered this correctly!) 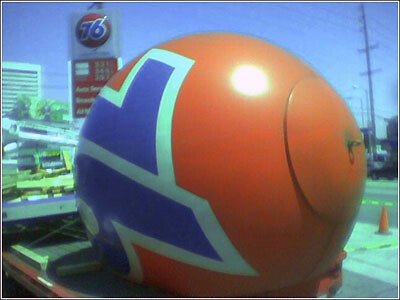 — the original Union 76 fiberglass BALLS (NOT DISKS) were manufactured ONLY in my hometown of Galva, Illinois (population 12[?]). 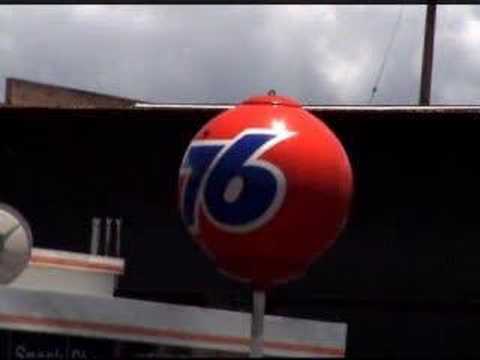 Just FYI (a little fun factoid): one Spring (I was, perhaps, nine years old), Galva was hit by a tornado, and the 76 balls (which were usually neatly lined up in rows OUTSIDE of the factory) were blown all over the town! My next-door neighboor was gifted by Mother Nature with one, and we rolled around inside of it until the fiberglass worked its nastiness on us! I also remember someone a few blocks away cutting one in half for his dog to use as a doghouse! 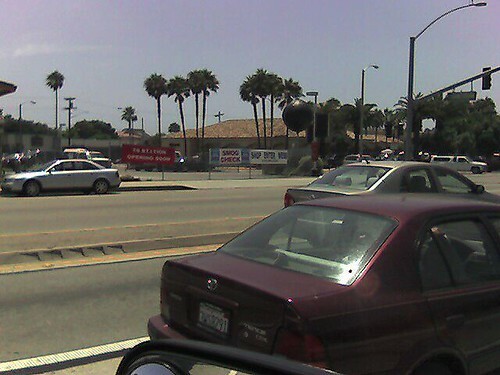 (I hope the dog escaped the wrath of the fiberglass!) I may have that wrong (I was young! ), but I am fairly certain that Galva is the ONLY place where the infamous orange balls were manufactured! I’d like to know more information, if anyone has any! P.S. Galva is sister city to Gavle, Sweden!